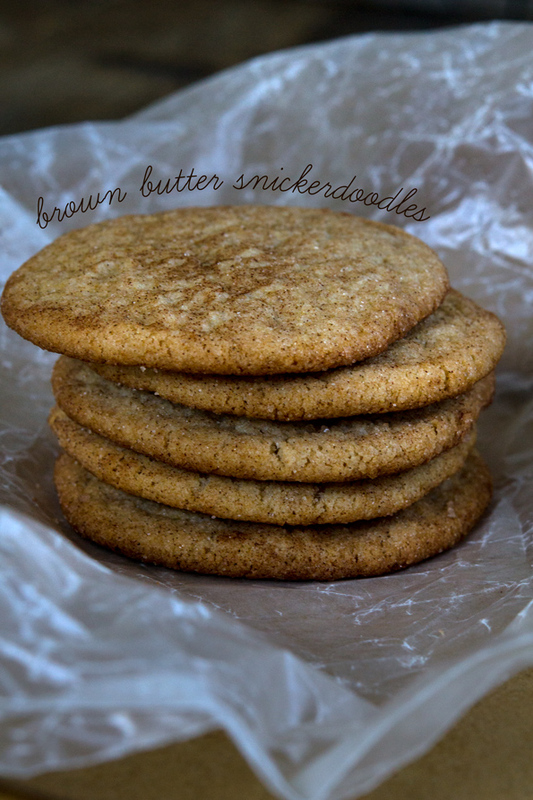 Brown Butter Gluten Free Snickerdoodles | Great gluten free recipes for every occasion. 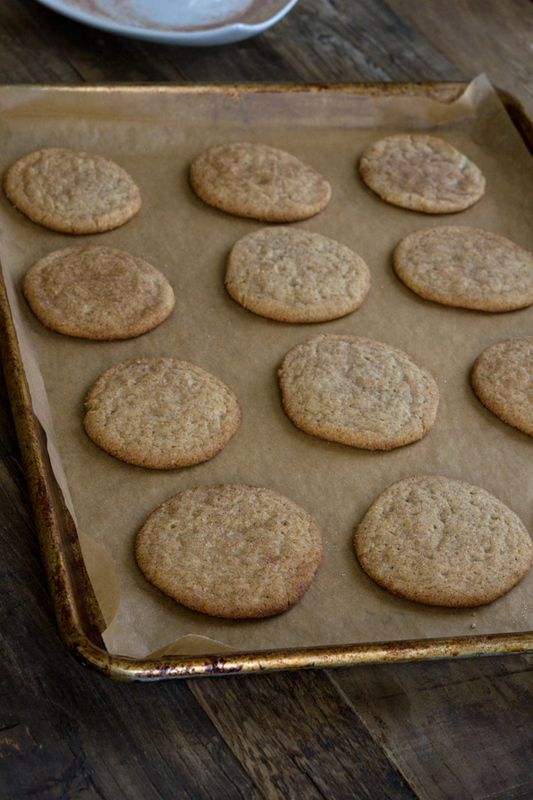 Gluten free snickerdoodles are an old-fashioned cinnamon-sugar cookie, made here with brown butter for a new twist on this old favorite. Leavened with cream of tartar and baking soda, they’re a thin and chewy delight! See all that cinnamon sugar on top of these gluten free snickerdoodles? It’s inside, too. And it doesn’t even come off and litter the bottom of a perfectly clean school lunchbox. I hate it when lunchboxes come home littered with crumbs. These cookies spread in the oven, but they spread perfectly in all directions, leaving a cookie that looks just like it came from the very best bakery. But instead it came from your kitchen. If you’ve never browned butter, you’re in for a treat. I describe it all in the instructions, but the way to make sure you don’t burn the butter (in which case into the trash it goes) is to remove it from the heat if you even see so much as a hint of browning. If it turns out that you’re wrong, just place the pan back over the heat. 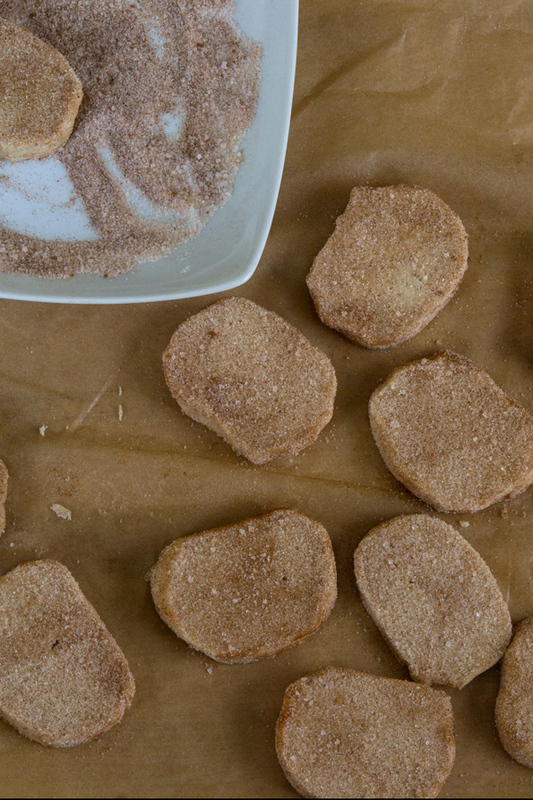 Last time I posted a recipe for gluten free snickerdoodles, I had a different way of making sure they emerged covered just so in cinnamon sugar. And … no brown butter. That recipe is much the same as this one, so if you don’t want to go through the trouble of browning butter (although really you should), use that one. 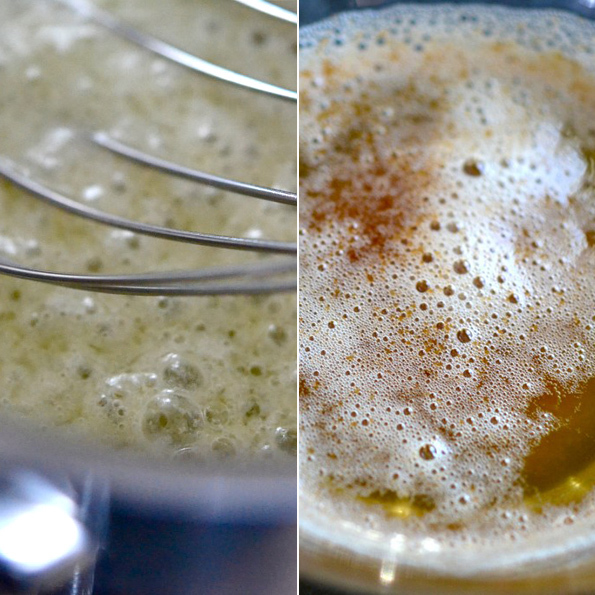 But use this method, brown butter or not. 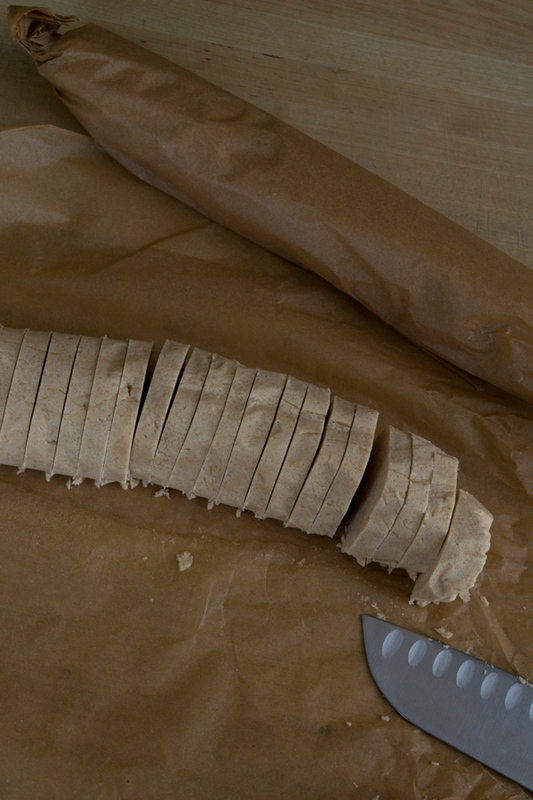 Chill the dough in cylinders, then slice, press into cinnamon sugar and …. bake. Perfect every time. The dough only needs to be chilled to make it easy to slice, not to bake properly. Thin & chewy, cinnamon-sugared and nice and extra puffy from the right mix of baking soda and cream of tartar. 4 dozen cookies definitely leaves enough for the cook to have a couple with her morning coffee, right? First, brown the butter to make the cookies. Place the butter in a small, heavy-bottomed saucepan, and cook over medium heat, stirring constantly. First, the butter will melt, and then it will boil and foam. Continue to stir, and watch carefully. The protein solids will separate and drop to the bottom of the pan. As soon as you begin to smell a nutty smell, and begin to see a golden brown color start forming around the edges of the saucepan, remove the pan from the heat and continue to stir. Once the bubbles clear, you will be able to see whether the protein has begun to brown. If not, return to the heat briefly, stirring constantly, and remove once the butter has begun to brown. Continue to stir, as it will continue to brown off the heat. Pour the brown butter into a small, heat-safe bowl, and set it aside to cool until no longer hot to the touch. In a large bowl, place the flour, xanthan gum, salt, baking soda, cream of tartar, cinnamon and sugar, and whisk to combine well. Add the eggs, and the cooled brown butter, and mix to combine. The dough will be thick, but soft. Divide it equally among two large pieces of unbleached parchment paper or plastic wrap. Roll each piece in the paper or plastic into a cylinder about 1 ½-inches in diameter, and roll to wrap tightly, twisting the ends to seal. Place the dough in the refrigerator until firm (at least 1 hour, and up to overnight). When you are ready to bake the cookies, place the cinnamon and sugar for the topping in a shallow bowl or on a rimmed plate, and whisk to combine well. Line rimmed baking sheets with unbleached parchment paper and set them aside. Preheat your oven to 350°F. Remove one piece of dough from the refrigerator, and slice it in cross-section into about 24 pieces, each about ½ inch thick. Press each disk of dough into the cinnamon-sugar topping mixture on both sides, and on the edges if you can manage. Place the cinnamon-sugar-covered disks of dough on the prepared baking sheets, about 2 ½-inches apart (the cookies will spread during baking). Place the baking sheets, one at a time, in the center of the preheated oven and bake for 8 to 10 minutes, or until the cookies have spread to about double their original size, have taken upon something of a crackled appearance (as the cinnamon-sugar topping has spread) and appear set. Remove from the oven and allow to cool on the baking sheets until firm (about 5 minutes). Repeat with the remaining dough. request for the blueberry buckle. Had to tell the poor little guy we were out! Guess that is next on my list to make up and freeze for breakfasts. You’re the best, Jennifer! That blueberry buckle would work great with frozen blueberries, for sure. I’m so glad this snickerdoodle recipe doesn’t call for XL eggs. Thank you. Oh but it does – 120g = 2 XL eggs. and I read somewhere that you MUST follow baking instructions exactly – especially when it comes to eggs. Ok – so it’s not that bad. seriously. Here’s what I do because I buy the cheapest eggs I can find. I either use 2 large eggs and make sure to weigh them and add egg whites to get to 120g OR you could whisk up 3 large eggs and then weigh out 120g and use the rest for a quick scrambled egg snack. It will hold in the fridge – so you could use it the next morning. I’ve even gone out of a limb *GASP* and used egg beaters instead of regular eggs in some of the baking recipes. NOTE: all of this is at my own risk. Nicole is one person and cannot try all of these out for me – this is a responsibility I can handle. Ooh, you had me at brown butter, yum! I’m making these ASAP :) My kid might be mainly a chocoholic, but she’s also a butter-aholic (if there is such thing). I love butter, Dana. Nothing else is quite like it! Should these be soft and chewy or firm and crunchy? As I explain in the post, Misha, they are thin, soft and chewy. We love snickerdoodles around here, and I agree that slicing will make life easier and neater. We’ll be working hard this week, baking batches of breakfast cookies and English Muffins for the freezer. School starts next week, and I need breakfast and snacks for four, three of whom are runners and eat constantly. I plan to have them each pick out a recipe and make it, why should I do all the work? Not for nothing….but if you’re swirling around ideas for your next book….maybe a cookie book? John! So much neater slicing them indeed. Slicing doesn’t work well for every cookie, but when it does it tends to make things much easier indeed. I’m definitely swirling, & in fact my agent and I are trying to hammer out a deal for Book 4 right this very moment! As soon as it’s hammered, I’ll happily spill the beans (hint: not cookies). I love making cookies, but I think a cookie book is already in the pages of this blog! I accidentally read that as “As soon as I’m hammered…” That actually seems like a good way to get you to spill the secret! YEA! another cookbook! :) And someone is hammered somewhere right? Always, Jennifer. :) And I’m only planning to continue writing cookbooks since I have nothing better to do!